Retirement Daze: What a neighbor! One mid-morning in early March, Husband Walter and I cruised through the mainland area of Gulf Islands National Park not many blocks from where we live. We spotted this huge occupant of the alligator pond. Actually the reptiles are not corralled in the pond. They are free to park wherever they choose in the adjacent bayou and salt marsh. Sometimes they even venture onto the road or onto the road or into the picnic area. 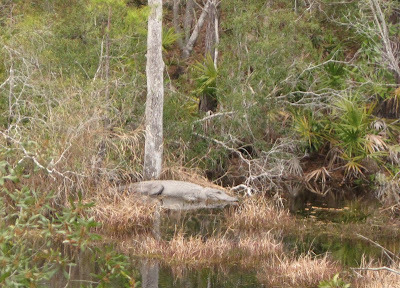 This gator had to be longer than six feet and was probably closer to eight feet. I hope you keep your doors locked, you never know how smart they are! Wow, I had to look at the photo twice, because the gator looked like a concrete ledge. Lol. i am glad he is NOT my neighbor.. but great shot. we went to the Okefenokee swamp when my kids were teens and these guys were laying on the paths and beside the paths, big ones and the guide said if you don't bother them they want bother you. RIGHT is what i thought then and now. Today, i understand they are having a battle with ferel pythons let go by pet owners. I am rooting for the American Alligator. We use to say in Florida, "If you put in a pond, you have built a home for a gator." They will find it. That is a really big one. Hope people leash their dogs.